It's time for the fifth annual Emerald City Comicon report. As usual, I'll have forgotten the exact order events happened, and no doubt will forget people who I really ought to mention. I'm sorry in advance for any inaccuracies in this report, and please, if you see an obvious mistake feel free to correct me. Old reports are here: 2003, 2004, 2005, and 2006: part I, part II, part III and part IV. Lisa and I headed down to the con nice and early. We got a little messed up when the road we expected to take was closed for some kind of repair, but after a short detour we got to the right spot and parked in the event parking garage. It was $10, but I'd expected it. Lisa was a bit shocked, but dealt with it. We parked on the third floor, then headed down the stairs and noticed that a line was forming at the entrance to the balcony. We walked over and asked if the line was for the Comicon, and when we were told it was, we joined in. It was cold, we had about a half hour wait, and we were in line with a large group of fellow nerds. We talked, laughed, and generally had a good time. The pros and dealers were walking past us into the con from the parking garage. Lisa found the rules about drinks and decided to run back to the car to grab bottles of water for us. Just after she left, I spotted a couple of old friends walking by, and said "HI!" to Eric Shanower and David Maxine. Shortly after Lisa returned, Kurt Busiek and family walked by and we got to say hello to them. When they finally let us into the con, the front doors had already been open for a couple of minutes, so we ended up being late to the freebie table and anything else that had a line. Lisa and I headed down to the freebie table first just to see what it was like, but the line was all the way to the front door, so we just headed off to the Illusive Arts table. We ran across Heidi Meeley at the Comics Fairplay booth first, though, and said hello. Heidi delightfully claimed she didn't recognize either of us due to the weight loss (I've lost 70 pounds, my sister Lisa has lost 60). Then we got to Illusive Arts, and they happily took my jacket that I didn't want to lug around the con floor to hold in their booth for me. They also introduced me to Atomic Basement's Mike Wellman and Rafael Navarro. We didn't stay long, as I wanted to get the lay of the land, and so we wandered off to see who we could see. One of the first targets of interest was Kirk Jarvinen, as I had a little gift for him. I checked the program guide and figured out his location, and we headed over there. We handed over the Jelly Babies, and said hello to both Kirk and P'la, then wandered down to see Gail Simone. After saying hi to Gail, we noticed that there was no line for Margot Kidder. We headed over there, and I TROLLED MARGOT KIDDER!!! YAY! She was the first trolling of the day, but far from the last! After Margot came Peter Mayhew, who was sitting next to her. Yup, I trolled Chewbacca. I attempted to troll Feedback, but he really wasn't having any of it, so instead Lisa and I headed over to Hungry Tiger Press and officially met Eric Shanower and David Maxine. Lisa hadn't actually met them before, though she felt like she had (maybe because I talked about them too much?). We wandered back into Artists' Alley, and headed over towards Brian Michael Bendis' table. The line was longer than the line to the freebie table. However, there were only a couple of people in line for Michael Avon Oeming, and HE was the one sketch I hoped to get at this particular con. So we waited in line, trolled Oeming, then I asked for a sketch and was granted one. An aside here. I promised last year to post my sketches. I never got around to scanning them. I hereby promise this year that I will scan and post ALL my new sketches. I just won't say when. Ahem. Back to the con. Again we wandered, until we found Phil Hester and Ande Parks sketching. Naturally, I asked for an Aquaman from each of them. Happily I got Aquaman, and I trolled them both, and Ron Marz, who was sitting next to them. As we wandered past Tim Sale's line, a person called my name, and asked if I was Laura. I confirmed it, with confusion. I was then told by said person (Jason, I think) that he reads my blog, and that he'd asked after me at the Illusive booth, as I suggested in my pre-con post. To my surprise, he was a fan and wanted a picture of me. YIKES! I agreed, even though I dislike having my picture taken... but then, I've lost 70 pounds for a reason. Maybe I'll like my picture now that I've lost some weight. For the rest of the day, I proudly told everyone about "my fanboy". Lisa was much amused. 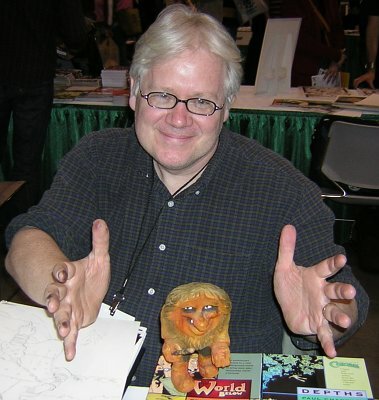 I then went to say hello to the Busiek family, and spotted Mark Waid next to them. I trolled Waid. I would've trolled Rucka at the same time, but he had quite a line. So instead I moved on. I visited the Denny/Madison Middle School Students, and trolled the two representatives present at the time of my visit. Greg wasn't around, but I was told he was off in the distance, so I started off to the distance, thinking I might run into him. I went to visit Brian Wood and Peter Gross. I complimented Brian on his works again, and told Lisa about them all. I also recommended Demo, Local, and DMZ to a fellow fan, who recommended Supermarket in return to me. Peter Gross... I needed permission to post a sketch he did in 2002, so I showed him the sketch and asked permission. He granted it, then decided he'd better do a new one, as the first sketch was definitely an "early in the day" sketch. His second sketch is very different, and I look forward to sharing them with you. While Peter was sketching, I trolled a Darth Vader who was walking around. Then, when Peter was through, I trolled HIM as well. BWAH-HA-HA-hA-Ha! Around the corner was Stefano Gaudiano, who looked at my face as I walked up, and said, "You're the Aquaman fan I did a sketch for a few years ago!" Yup, at the same con as Peter Gross' first sketch, in fact. I asked him to pose with the troll, then he noticed Lisa and asked if she wanted a sketch. She was thrilled, as she'd been holding back. I think that Spider-Man sketch is going to forever have a special place in her heart, because of the way it was offered. After trolling Stefano, I trolled Brandon Jerwa. 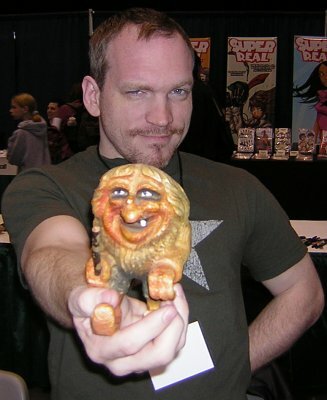 While Lisa got her sketch from Stefano, I went over to troll Paul Chadwick, and chatted a bit with Mike Grell.